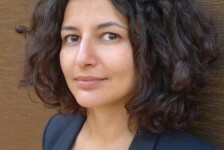 Fatoş Üstek is director and chief curator of DRAF (David Roberts Art Foundation). She is recipient of curatorial fellowship at Tornabuoni Art, London 2018, curator of Do Ho Suh’s largest commission in the UK, 2018 co-commissioned by Art Night and Sculpture in the City, curator of miart Talks 2018, Milano; Art Night 2017, East London; and fig-2, 50 projects in 50 weeks, 2015, ICA Studio, London. Üstek is external member of acquisitions committee for Arts Council Collection (2018-2020), contributing editor to Extra Extra, chief-juror for the Celeste Prize 2017. She is founding member of Association of Women in the Arts (AWITA); Art Nights Trustee, member of Block Universe Advisory Board, member of AICA UK, and ICI Alumni. She curates, lectures and publishes internationally, recently at Sotheby’s, Goldmisths College, RCA and in art magazines such as Mousse, L’Officiel and Camera Austria. She is listed in the celebratory Apollo 40 under 40 Thinkers section in 2018 alongside other most talented and innovative young people; included in Evening Standard’s Progress 1000 London’s most influential people in 2018 and 2017; Artlyst Power 100 list 2018, and 2017; nominated for ICI Gerrit Lansing Independent Curatorial Vision Award in 2016. Ustek acted as associate curator for the 10th Gwangju Biennale in South Korea, has curated an opera in five acts at DRAF, London; an exhibition trilogy entitled Now Expanded that took place at Kunstfabrik, Berlin; Tent, Rotterdam and DRAF, London among various group shows in Europe, Far East and Turkey. Ustek is founding editor of Nowiswere Contemporary Art Magazine (with Veronika Hauer) actively worked between 2008-2012, is the editor of Unexpected Encounters Situations of Contemporary Art and Architecture (Turkish Only, 2012) published by Zorlu Centre, Istanbul; is author of Book of Confusions, 2012, published by Rossi&Rossi, London. In 2008 Ustek received her M.A. at the Contemporary Art Theory Department at Goldsmiths College London, after completing her BA in Mathematics at Bogazici University, Istanbul. Additionally, where she also acquired a degree from the Film Studies.